Speaking of new product...that is exactly what I used to make my mom her Mother's Day card. 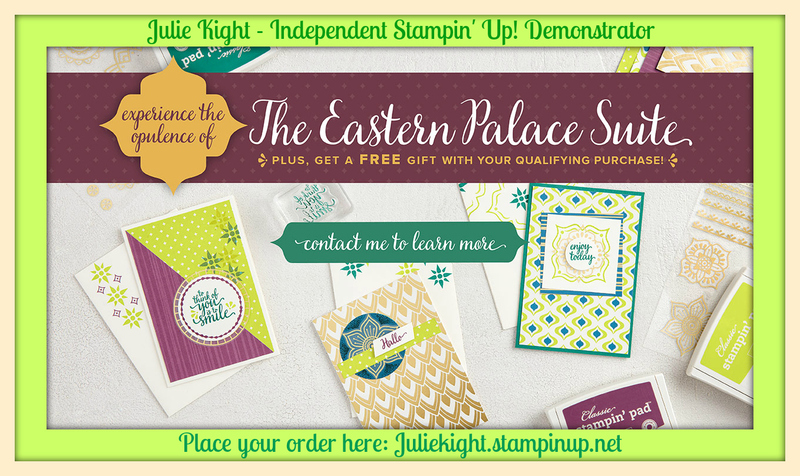 I used the Delightful Daisy Suite from the new 2017-2018 Stampin' Up! Catalog. I got to work with this product at OnStage in April which was a blast and I ordered it in my Product Premiere Purchase order, a special extra for being a demonstrator that goes to OnStage! I also use a couple retiring stamps because they had the sentiments I needed. But all in all I used all the items from the suite. The DSP (Designer Series Paper) is so beautiful. I love all the colors they used in it including one of the new In-Colors...Tranquil Tide. And it is so beautiful against Daffodil Delight. My mom loves the color yellow too so that is where I went with this card. 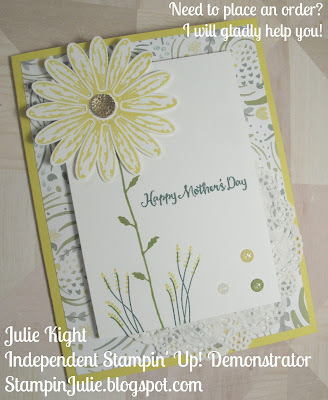 I first chose my DSP then put it onto a Daffodil Delight A2 sized card base. I wanted a lot of the DSP to show so I made the next layer a little smaller then I usually do. It is 3"x 4-1/4". I made the flower out of the stamp included in the set and the new Daisy Punch. 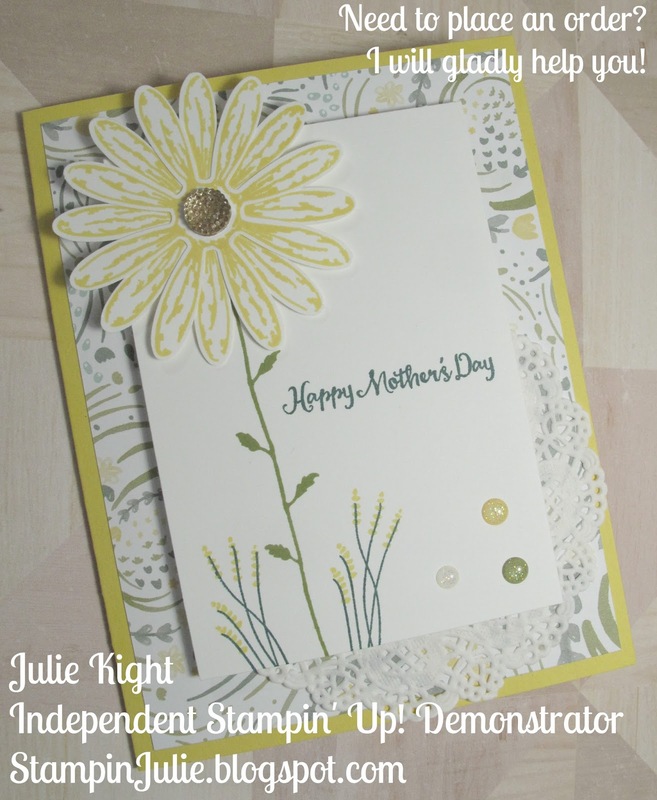 I stamped the stem onto the layer and positioned the daisy with dimensionables on top. I stamped the other flowers on the bottom and then the sentiment. Pretty quick card. I positioned the doily onto the card base, then used Foam Adhesive Strips to pop up this layer. I added a little bling with the new Faceted Gems and Glitter Enamel Dots. And I always believe you should decorate the inside, I cut a piece of Whisper White cardstock and stamped it with my sentiment and some smaller daisies down the side and some leaves in the corner. How do you like it? A very simple yet very beautiful Mother's Day card! Here is a list of everyone in this Blog Hop, so if you get lost at anytime just click on anyone's name and continue. Thank you so much for coming to my blog today! I hope you were totally inspired by my project and I hope you are looking forward to the new catalog as well! Get those wish lists out now and start writing down what you see and be prepared on June 1st when the new catalog goes live at 12pm MDT! What's not to love about that daisy? Pretty card. Gorgeous card - so bright and cheerful! Your card is so lolvey, love the colors. What a sweet card! I am loving the colors and layout! Beautiful balance of colours and layout.